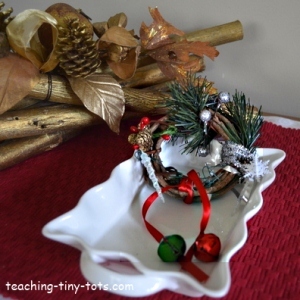 Make a cute Christmas Wreath Door Hanger. This can also be made into a tree ornament. 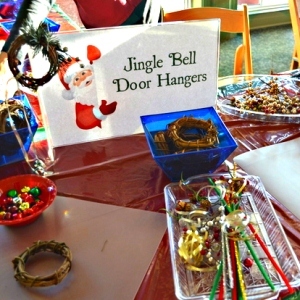 Christmas Toddler Activities: Make a Christmas door hanger with bells and decorations. Cute party craft for a make a take idea or classroom craft as a gift to parents from students! Great for ages 5+. Some 4 years old children made one did this activity with assistance in attaching and tying the decorations onto the wreath. Have decorations in trays, plates or small containers. Tie bells onto a ribbon. Tie ribbon with bells onto the grapevine wreath. Attach decorations by twisting onto wreath or inserting between vines. 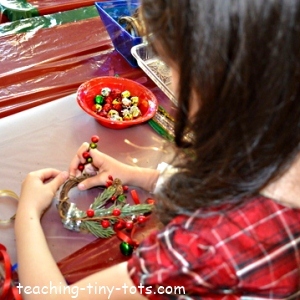 Decorations can also be attached using pipe cleaners. To add more securely, Fabri-Tac will hold pieces down but should be applied by an adult. Have all materials ready before starting. Explain how and where pieces can go. Stringing the bells were the most difficult and required so pre stringing them might work better for younger children. For younger children, have them show you where they want the decoration to be placed and have an adult or older sibling assist. You can make it into a Christmas Wreath ornament instead of a door hanger if you prefer. It would be a great inexpensive classroom craft and perfect for a gift to parents. This can be done with large groups of children. Create a small work station for each child and have an adult ready to assist. One parent to 3-4 children would make this run smoothly.